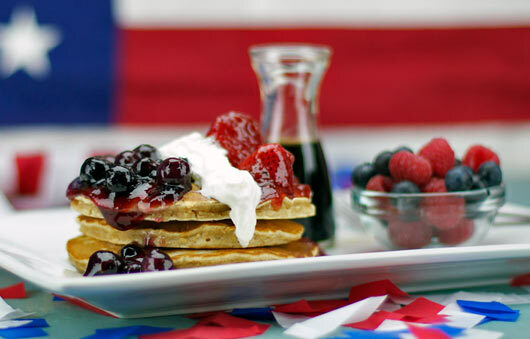 This quick and easy version of patriotic pancakes uses jam and fresh berries to make separate blueberry and strawberry compote toppings. 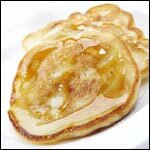 You can use any pancake recipe for the pancakes, but I have links to a couple of my favorites below. 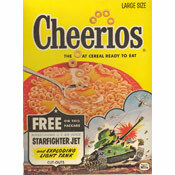 Also consider using the toppings here to give a patriotic presentation to waffles or French toast. I especially like these pancakes because they remind me of breakfasts I've had in mom and pop diners during the 4th of July season. Go America! In a small sauce pan over medium heat, combine the blueberry (or grape) jam with 2 Tablespoons of water. Stirring often, cook down until completely fluid and no longer jelly-like. Stir in the blueberries. Reduce heat to a simmer and cook for 5 to 10 minutes - stirring occasionally. Transfer blueberry compote to a bowl and cover to keep warm. Wash sauce pan. Repeat compote directions in last paragraph using strawberry jam, 2 Tablespoons of water and fresh strawberries. For this compote, the desired effect is to create a glaze to coat the strawberries. 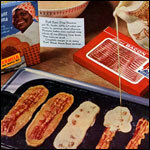 You could also use frozen pancakes or pancakes from a mix. As long as you have pancakes, you have 4th of July breakfast party. To construct each serving, stack three pancakes. Top blueberry compote down one half and strawberry compote over the other half. Dollop whipped cream down the center. 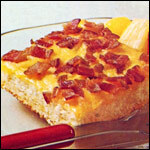 Serve with fresh maple syrup and any compote that's leftover after topping. To make Homemade Whipped Cream: Beat 1 cup of heavy cream with an electric beater until stiff peaks form. Add 1 Tablespoon powdered sugar and 1 teaspoon vanilla extract and beat until combined. 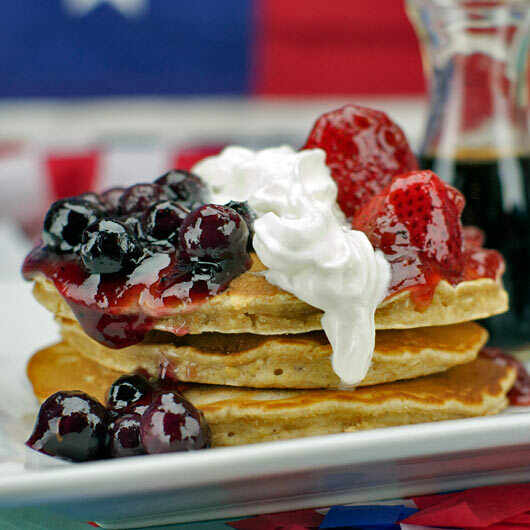 Good old American pancakes with blueberry topping, strawberry topping and whipped cream to put the colors of the American flag in your breakfast. 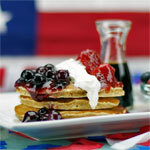 What do you think of Red, White & Blueberry Pancakes?